Retail $6.99 SAVE 30% ! 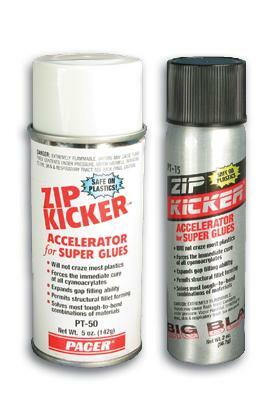 "Handy addition to the modeling workbench"
Zip-Kicker is a CA glue accelerator spray that comes in handy when tacking small parts that need to be held in place or set quickly. It has another great use too and that is to tack wiring in place inside a model used for lighting or other applications. You can route your wires, put a dab of CA glue and then spray with Zip-Kicker to secure them neatly. A 2 oz spray can will go a long way. Forces cure of large amounts of SLO-ZAP when forming fillets.. This can is labeled FLAMMABLE 10-08-98kz ir/jl.